1 Why Choose Katy Weight Loss Center? Why Choose Katy Weight Loss Center? No commercial weight loss programs have ever been proven to be more effective than the medical weight loss programs that we offer. Our weight loss programs include a combination of weight loss supplements, low calorie diets and prescription appetite suppressants for fast and long term weight loss. Under medical supervision, our rapid weight loss programs offer a safe and easy way to lose weight. You can trust that you are in experienced hands when you come in to Katy Weight Loss Center. The professionals at our weight loss clinic are proud to be always up to date on the latest advances in medical weight loss. Katy Weight Loss Center invites you to visit our testimonials page and read about our weight loss success stories. These stories offer testimony that other people just like you, or with similar weight loss struggles, have been able to lose weight with our weight loss programs. They took that first step into their weight loss journey. You can too! SmartLipo is a liposuction procedure that uses a laser to melt fat and tighten the skin. The melted fat can then be gently suctioned from the body. SmartLipo can remove as much fat as traditional liposuction with less risk and less downtime. The staff at the Katy Weight Loss Center is always happy to provide you with the tools and knowledge that will get you results. 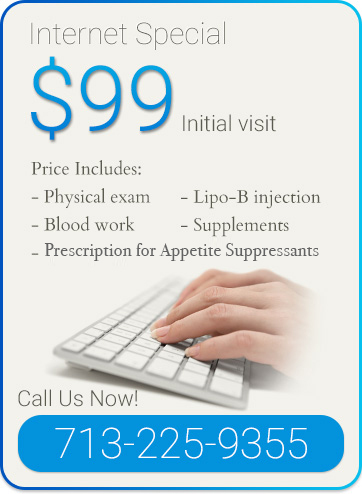 Our weight loss clinic is conveniently located in Katy TX and customer service is our number one priority. To better help you with the registration and check-in process, we have uploaded forms and directions to our offices. Please download and fill out your personal health history before your first appointment.